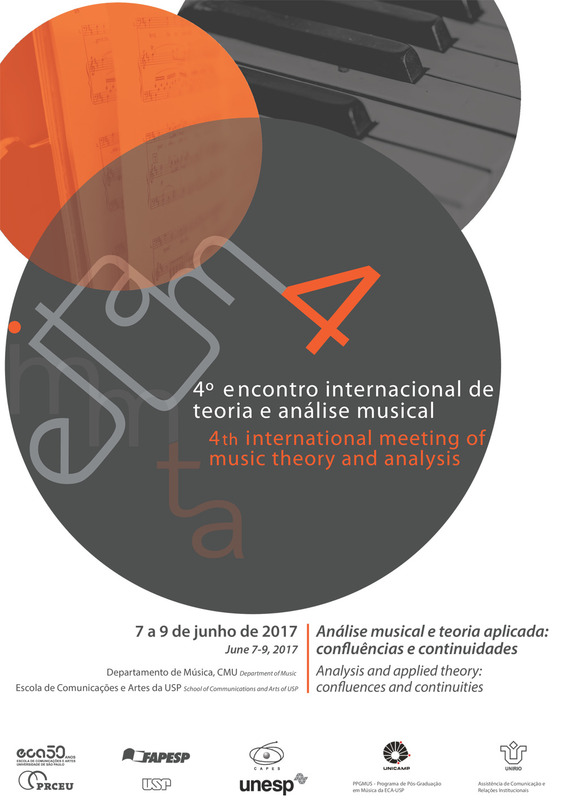 The 4th International Meeting of Musical Theory and Analysis, EITAM4 - entitled Musical Analysis and Applied Theory: Confluences and Continuities - is conceived and organized in cooperation between the USP, UNESP, UNICAMP and UNIRIO Post-Graduation Programs in Music (PPGMUS). Its main objective is to strengthen research in the areas of Theory and Musical Analysis in the national academic scene. As a theme of the event we chose Musical Analysis and Applied Theory: Confluences and Continuities, in the sense that, in music studies, the intellectual production that expresses itself textually shares with the sound practices the interpretative process, as substrate, naturally intermediated by an accurate and musically developed perception. In this environment of musicological studies, we have the theoretical resource as an investigative base. At the confluence of these studies is the musical analysis, an interpretive practice whose main purpose is the understanding of musical processes. By using textual expression, musical analysis strongly influences the process of sedimentation and maintenance of knowledge. Since it is the way to apply the methodologically organized theoretical references, it lends them clarity in the expression of the interpretation of sound practices. And finally, by interacting with the constant transformations resulting from the vividness of sound practices - of creation in composition and performance - the reflections that derive from the practice of musical analysis have active historical participation in artistic renewals. In this sense, the practical application of emerging theoretical concepts involves the so-called musical analysis, aesthetics, musical perception, musical performance and musical creation, both in the Music and Art areas, and in areas that establish dialogues with them - as is the case of Philosophy, Mathematics, Computing, Literature and Pedagogy, among others. The Meeting will be held on June 7, 8 and 9, 2017. It will have 5 mediated conferences, 2 of them by Brazilian guests and 3 by guests from other countries; 5 mediated round tables, with participation of 3 invited researchers in each of them; 2 mediated sessions of Working Groups; 5 sessions of communications resulting from spontaneous submissions evaluated through the double blind review, as presented in the Programming Page. May we have a productive and inspiring encounter with our most audacious musical curiosity!